Home > Air breathing fish > Blue dwarf gourami fish. The hardy blue dwarf gourami are ideal fish for a bowl. 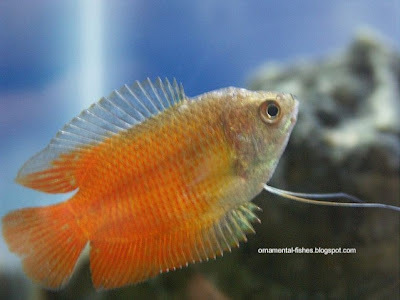 The gourami (Colisa lalia) belong to the genus Colisa and family Osphronemidae. 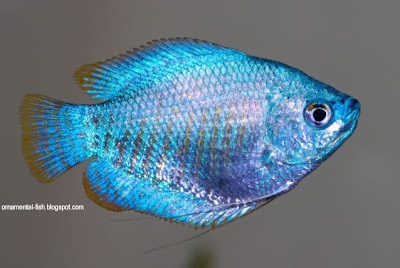 Though in their native range these are abundantly available in wild, blue dwarf gourami have become very popular pets for aquarium due to their hardiness and enchanting colors and patterns. 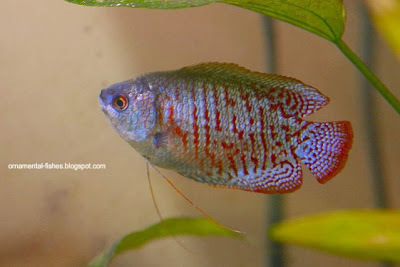 Gourami are native of South Asia and found in wild in India, Pakistan and Bangladesh. In South India, the wild catches of gourami are sun dried for use as dry fish as well as for animal feeds. These blue gourami are found among the vegetation in many rivers, streams, ponds and lakes. Blue gourami grows to a length of about 1.5-3 inches. In wild the male has diagonal alternating stripes of red (orange) and blue whereas the female are more silvery in color. By selective breeding many breed variants of blue gourami have been developed with striking colors and patterns. They have a thread-like pelvic fin which is touch sensitive. They are labyrinth fish and can breathe directly from air using their labyrinth organ functioning as lung. It will be ideal to keep a pair of them in a large bowl. As they can breathe directly from the atmosphere aeration is not necessary. You can keep undergravel air-lift filter to keep water clean and also to develop useful bacteria. Keep some floating artificial plants as the male blue dwarf have the chronic habit of blowing bubble nests and hiding among the floating plants. 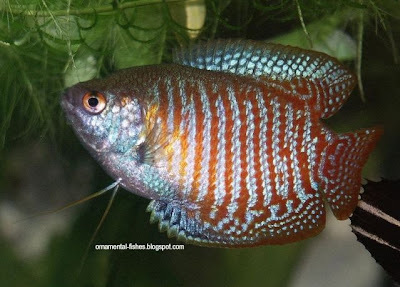 Dwarf gourami tolerate fairly high temperatures of 80°F (27°C). These fish rarely get diseases. Keeping the fish properly fed and in health conditions can prevent diseases. Higher temperatures reduce the risk of Ich disease. Iridovirus has been found to affect these fish. 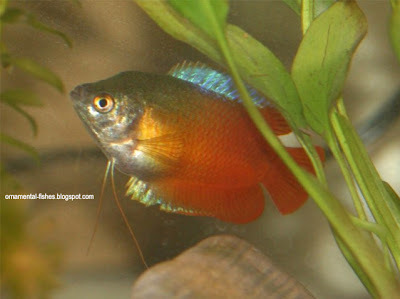 Sick dwarf gourami may stop feeding and its abdomen may get distended. This viral disease appears to affect in warmer conditions. These fish are omnivores eating algal matter and small invertebrates in nature. You can feed the pets with blood worms, flakes and pellet formula feeds. They also like live bloodworms and tubifex worms. A varied feed of algal and animal sources can give them balanced amino acids, vitamins and minerals. Apart from color patterns the male has pointed dorsal fin whereas the female has rounded and curved dorsal fin. Mature male builds bubble nest among the floating vegetation. Peat fiber also can become a good nest-building material. When the female is induced by the male, it releases eggs on to the bubbles and male fertilises them. This may happen several times for about 2-3 hours and finally the male will release bubbles below the eggs to cover them completely. The female fish must be removed after spawning as male becomes aggressive and guards the nest. In three days they will be developed sufficiently using the yolk sac and start leaving the bubble nest. At this juncture the male of these blue dwarf gourami fish must be removed as it may start preying upon the hatchlings. 2. Finding quality breeding platies. 3. Selective breeding of platy. 4. Platy breeding for beginners. 5. Male, female and pregnant platies. Blue dwarf gourami in bowl.